The Osage orange tree (Maclura pomifera) was originally native only to the south central area of the United States, particularly parts of Texas, Oklahoma, and Arkansas. During the westward development and settlement of the U.S., the tree became widely spread and cultivated in other parts of the country. The wood of the Osage orange tree, because of its strong but flexible nature, was used by the early Native Americans for making bows and war clubs. This led to one of the early common slang names for the species—Bow Wood. Even today this wood is still commonly used and highly desirable in the making of quality bows for sportsmen and hobbyists. Another early use for Osage orange and a reason for its proliferation was the planting of hedges that were needed as windbreaks and livestock barriers. This was in the days preceding the development and use of barbed wire to build fences that were needed to control livestock. Additionally, as barbed wire fences did come into being, the toughness and resistance to rot made the wood of the Osage orange trees desirable for use as fence posts. The trees are still used today for plantings as windbreaks in some of the prairie states. 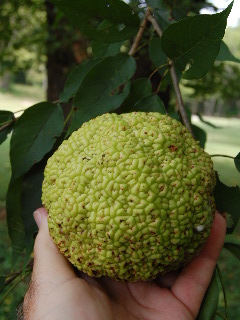 The widespread plantings of the species into hedges and the large rounded fruit produced by the Osage orange has led to another one of its common names—hedge apple. Speaking of those distinctive fruits—the large (up to 5 inches in diameter) circular pods are actually a series of drupes grown together to form one big fruit that may contain many seeds. The fruits start out green in color but may turn more yellowish as they mature. Squirrels particularly seem to enjoy deconstructing the fruit in order to feast on the seeds inside. 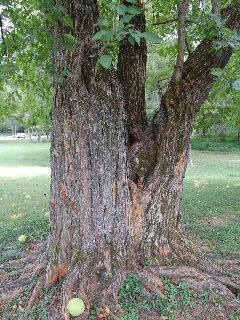 The bark of the Osage orange is furrowed and primarily of a dark color. However, near the base of older trees, the bright orange coloring (as implied in the name) starts to show through and is recognizable even at a great distance from the tree. Osage orange trees can sometimes be bought and planted as unusual specimen trees to be added to the home gardener’s landscape. However, the hedge-like agricultural plantings are probably still more common. Give careful consideration to whether or not you would want to add this species to your own home landscape. The branching limbs sometimes produce sharp thorns—good for impeding the movement of livestock, but not so good for the youngster who might accidentally brush by the plant while playing in the yard or riding his bike. Also, even though the large unusual fruits are a distinctive feature of the Osage orange tree, are you sure you want to contend with mowing around these in your lawn or cleaning up the mess the rotting or squirrel-damaged globes make? Osage orange is a remarkable tree, a reminder of the usefulness of a native species in the early settlement of the U.S., and a great and beautiful tree to observe—ideally, in a park setting.